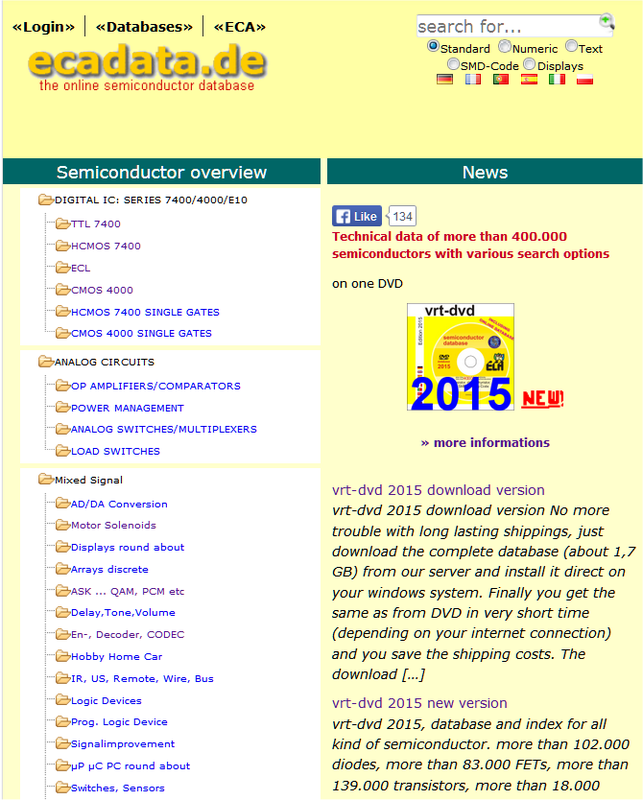 Database and index for all kind of semiconductor. more than 150.000 integrated circuits. 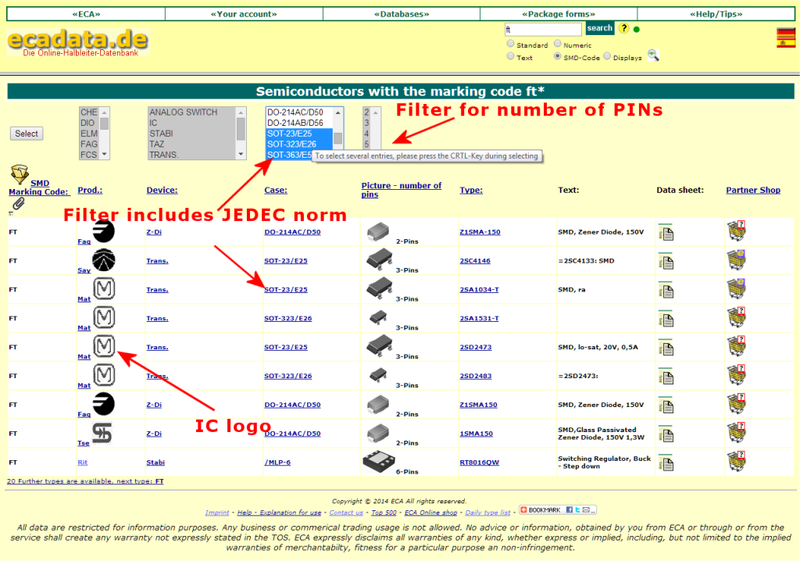 In addition to search for type, numeric part of the type, the device, the SMD CODE or the text you can search and select for parametric in the discrete semiconductors database . New park function allows to save each type in a special table with your comments. 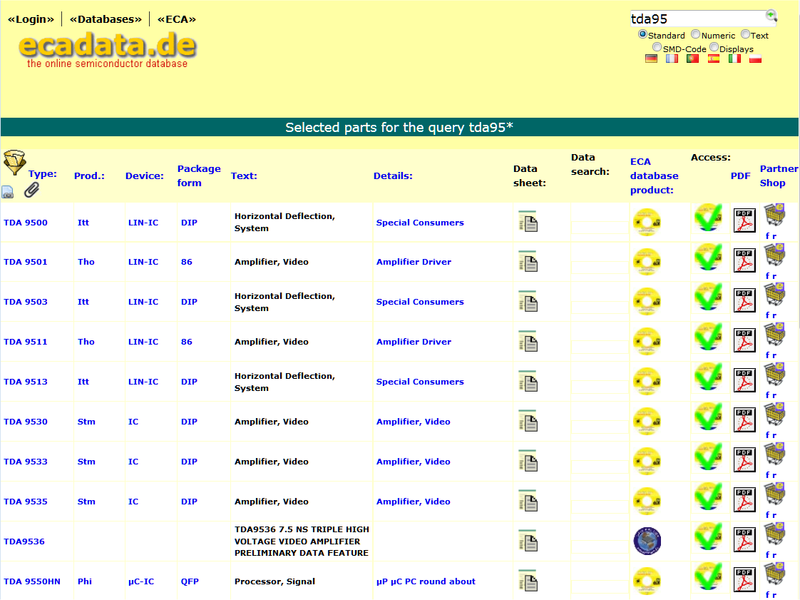 All registered users of the software will have additional access for 1 year to the vrt (integrated circuits), tdv (transistor, FET) and ddv (diode, thyristor) online data base at www.ecadata.de. We will get the new dvd at the 23.Nov.2016, but the download version (about 2,7 GB) is ready now. Direct order download version for 57,00 Euro payment with PayPal. Direct order dvd version now for 59,00 Euro plus 7 Euro shipping (worldwide) and pay with PayPal? System requirements: Windows® System XP/VISTA/Windows 7/8/10 and a DVD drive assembly. *The download version includes the serial number and a unlock code. You can install the program on max. 3 different computer. During the installation a internet connection is necessary, you use the program afterwards also without permanent internet connection. We completely redesigned the presentation of the ECA online database. So it should be very usable with all modern devices like mobile phones or tablets. Through responsive web design the respective size of the screen is adjusted automatically. In addition, we removed all frames to achieve a better and clearer navigation. Still, not all changes are perfectly, but as we are constantly working on the database, there is a regularly changes too. If you find errors or have suggestions, please contact us, we are grateful for any criticism and any remarks. Now a few basic examples and explanations of the changes. The main menu is reduced to the essential points. Login to login with your user name and your password. Register to create a new account . Edit account to change address, email or password. All user of the EURAS system will find a forward and back button to navigate the ECA website. In some browser the browser menu is switched off after forwarding from the EURAS login site. IC Logos a list of manufacturer logos to identify unknown SMD components. The input field for searching is now on the right and is activated by pressing the Return key or click on the search icon. Standard searching for type designation, also with wild cards like * and ? Numeric searching for the numeric part of the type designation. Text searching in the text field. 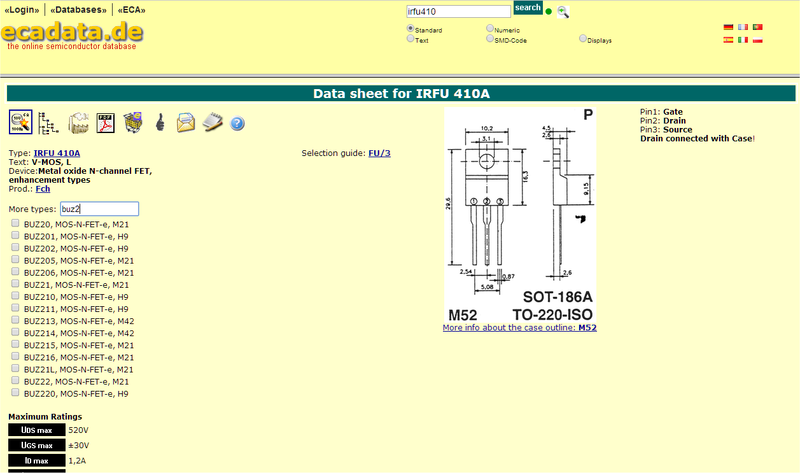 SMD-Code search for the SMD / marking code. 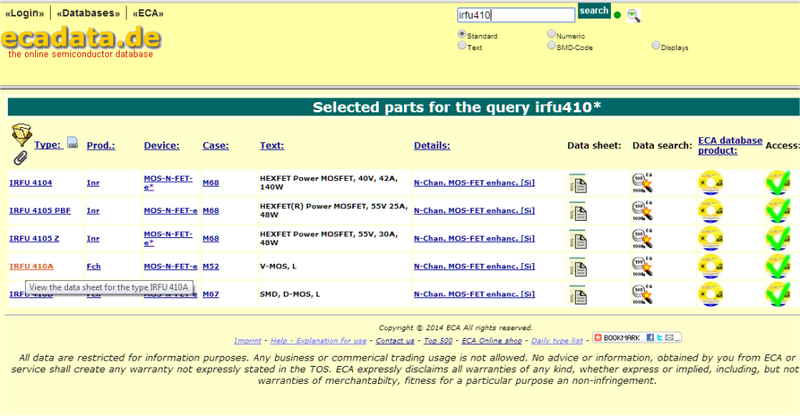 Displays searching in the database for displays. Below you can choose the interface language. The data lists were also improved accordingly, on mobile devices it should be possible to identify the content, without scrolling on the display. Also the marking code tables are changed, here a example for mobile phone. 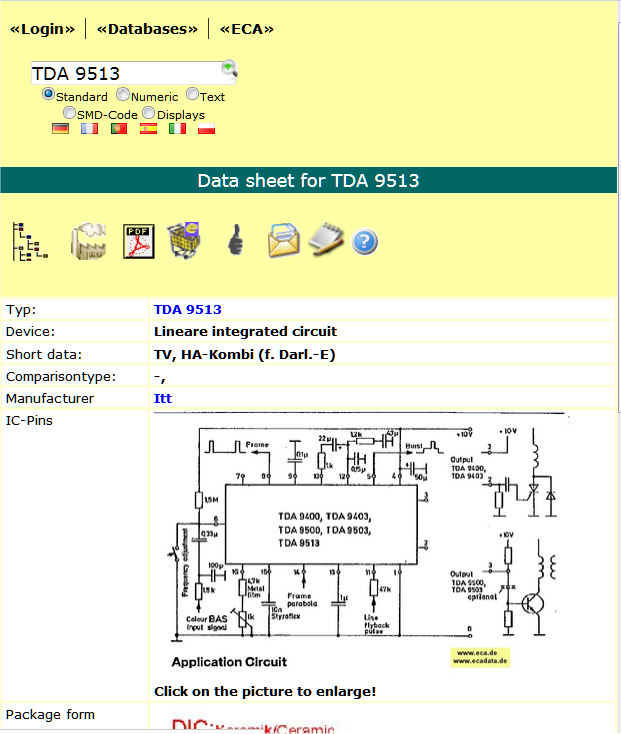 We change the layout of the data sheets too, here an example of the data sheet for a TDA 9513 on a mobile phone. We‘re still changing several parts of the program in accordance with, it is relatively complex and will also need some time to be all parts redesigned accordingly. I would be very happy if you try our website with your mobile devices and share your experiences with us. No more trouble with long lasting shippings, just download the complete database (about 1,7 GB) from our server and install it direct on your windows system. Finally you get the same as from DVD in very short time (depending on your internet connection) and you save the shipping costs. The download version comes with a serial number, which you need to create the ecadata.de online account (valid one year) and the unlock code to install the program. During the setup your computer must have a valid internet connection to verify the installation and you can install the program on 3 different computer. Order now for 50 Euro and pay with PayPal? System requirements: Min. Pentium III system, Windows XP/VISTA/Windows 7/Windows 8.
more than 145.000 integrated circuits. Order now for 52,00 Euro plus 7 Euro shipping (worldwide) and pay with PayPal? System requirements: Min. Pentium III system, Windows XP/VISTA/Windows 7/Windows 8 and a DVD drive assembly. 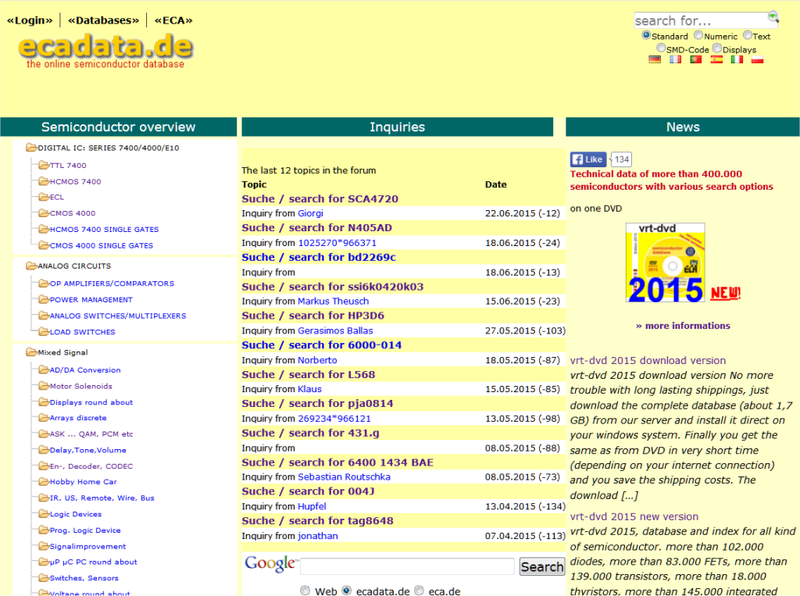 One more not so well known function on ECADATA.de. 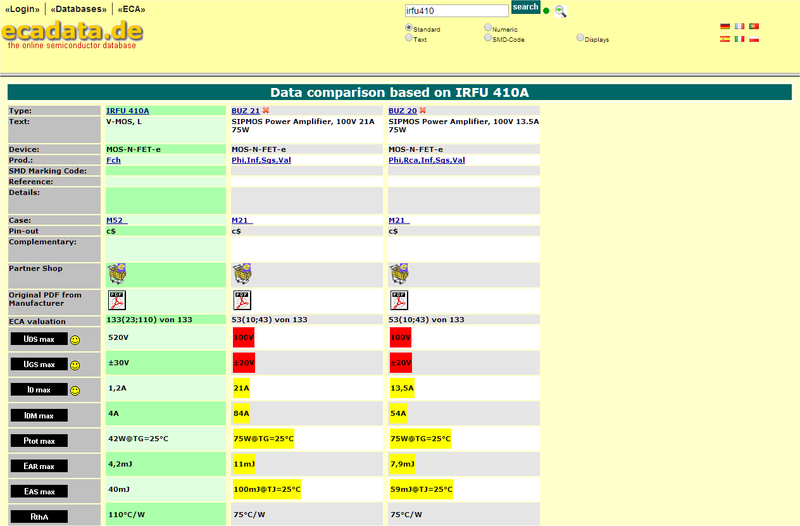 Open the ECA data sheet by clicking on the type number. Click on the scale and you can see the difference of all selected types. News at the ECA smd/marking code table. Meanwhile the ECA marking code table includes more than 100.000 marking codes and it was necessary to improve the query script too. Each user of a valid vrt-dvd can query the ECA marking code table too. Order now and pay with PayPal? more than 140.000 integrated circuits. 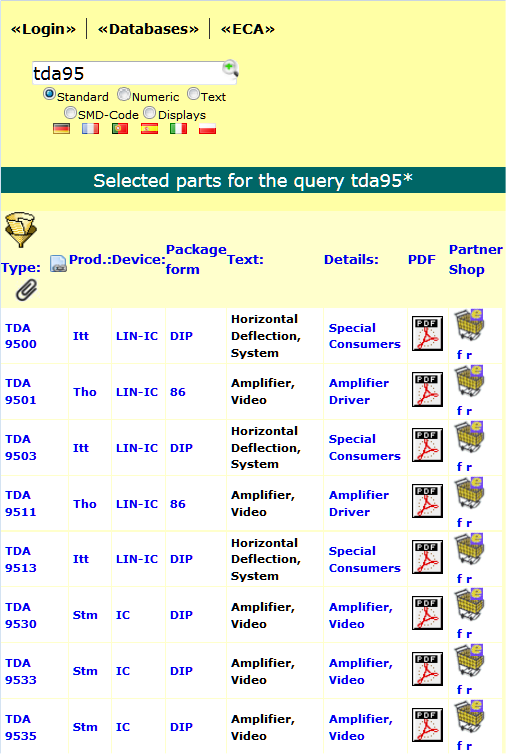 The ECA Semiconductor database include the technical data of more than 1.Million different components like transistors, diodes, FETs, IGBTs, thyristors and ICs. All components are separated in different databases and allow to search and query for technical values, package forms, type designations and general functions. Additional you can find a Marking code or SMD code database on the ECA Server to make it easy to identify the smd package form marking. 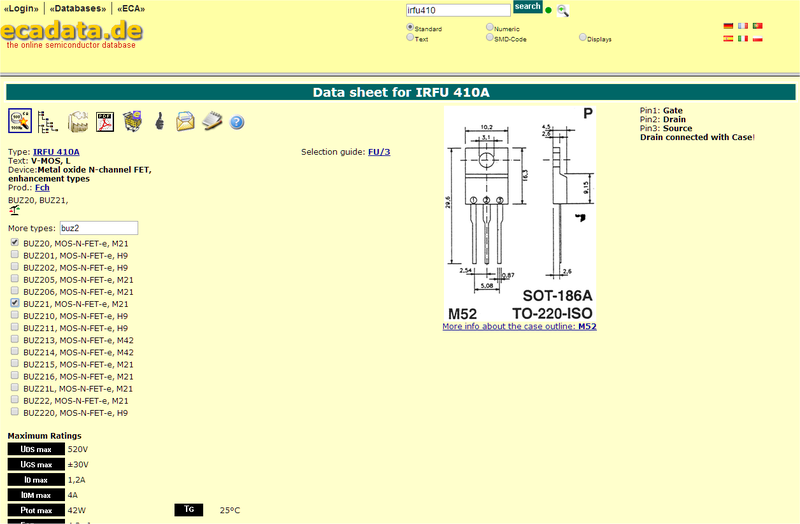 Than you can find a Semiconductor manufacturer overview and special manufacturer marking sign page. The various semiconductor package forms are also searchable stored in a database. Each registered user of a ECA DVD has access to the respective database for 1 year. Beyond you can order a pure Online account, available from 20 Euro per year on. 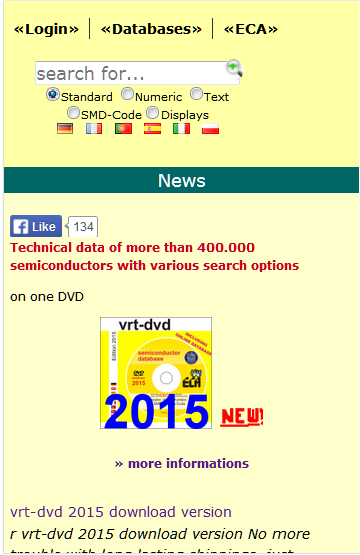 Also you can order a special VRT-DVD online for 40 Euro per year, equal to 3,33 Euro per month or 0,10 Euro per day. We also offer a free search service in case you can not find something, all inquiries will be answered on our forums. P.S. Even if you are looking for a supplier for parts, please use our semiconductor supplier search script which allows to locate in the online shop of various semiconductor suppliers at the same time. more than 135.000 integrated circuits. 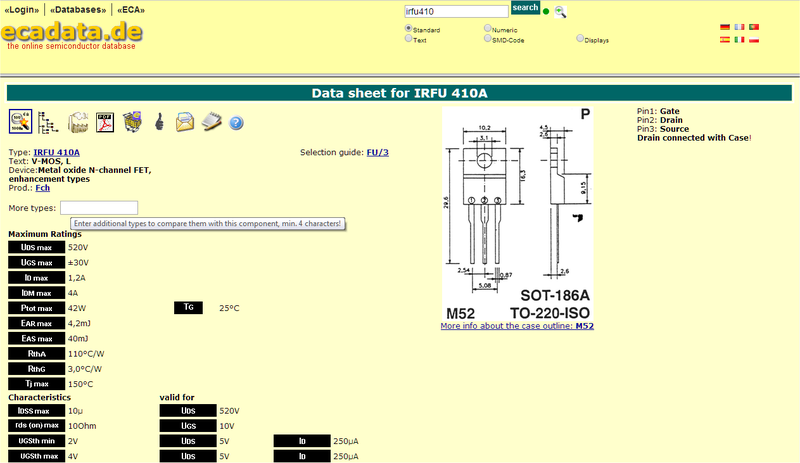 In addition to search for type, numeric part of the type, the device, the SMD CODE or the text you can search and select for parametric in the discrete semiconductors database. System requirements: Min. Pentium III system, Windows XP/VISTA/Windows 7 and a DVD drive assembly. We had recently improved the ECA manufacturers database and added a collection of known semiconductor manufacturer IC logos. 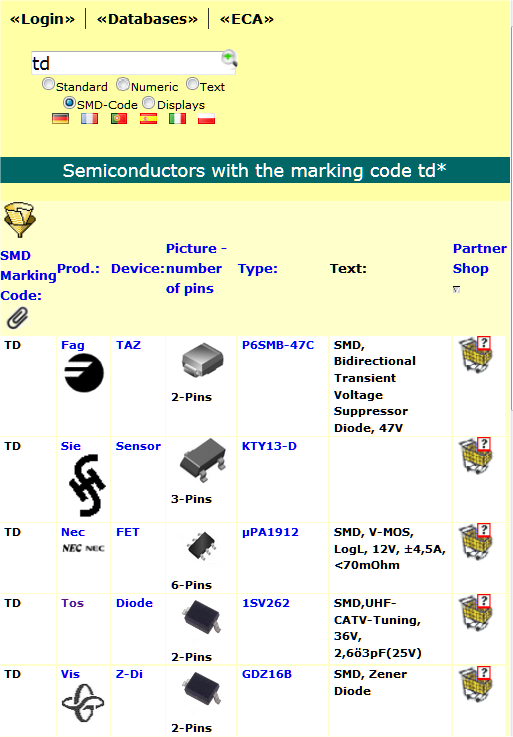 I should help to identify unkown SMD/markings codes on semicondcutors. Clicking on the logo will open additional infos about the manufacturer. 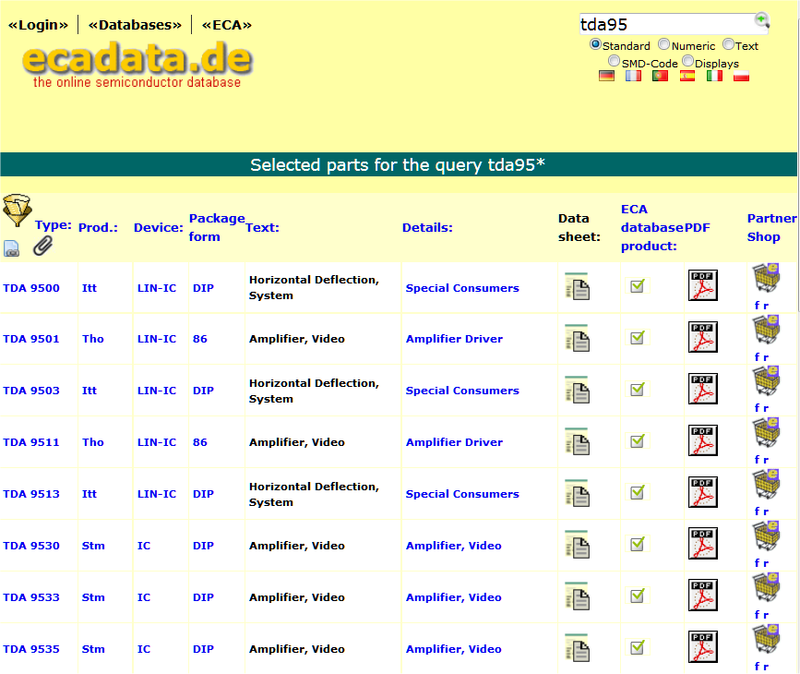 You can find this collection on the ECA database in the main menue <<databases>> <<SMD>> <<IC logos>> at www.ecadata.de. More information in the ECA wiki at http://wiki.eca.de. Messages about missing logos are highly appreciated.